Ink portrait sketches of heads of three men and a women at Jerome Relocation Center, Rivers, Arizona on November 9, 1944. Top left sketch of a grinning man, Mr. Komai, looking directly at viewer. He wears a garment with wide lapels. Visible from shoulders up. Top right cartoonish sketch of a balding head with three hairs standing up on top and a mustache over frowning mouth. Simple features. Bottom left sketch of a woman in profile facing right. Her head is inclined and her eyes are closed. Visible from shoulders up. 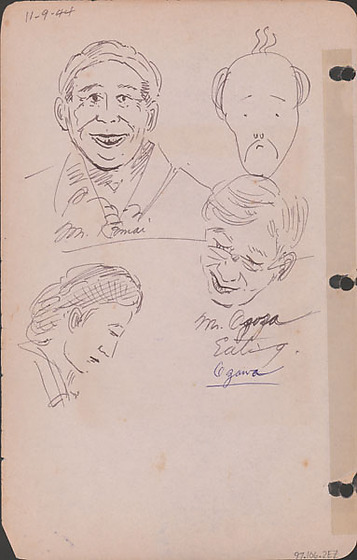 Bottom right sketch of a man's head, Mr Ozawa, as he eats. Ozawa wears glasses and his hair is parted on the proper left. His eyes are closed. Drawing 97.106.2EY on recto of same sheet. Written in black ink top left: 11-9-44. Written in black ink on top left image, bottom: Mr. Komai. Written in black ink below bottom right image: Mr. Ozara [overwritten] / Eating / Ozawa.